When young Jehan Daruvala's father asked him whether or not he wanted to attend his first ever karting training programme, despite the fact that he had exams to attend the following day, his answer was brief. 'But it's a question of my whole career,' said the 10-year old, insisting that come what may, he would certainly spend that weekend karting. As things turned out, it was a wise move on his part. At the karting training programme, run by Rayo Racing, he was spotted by India's ace karter Rayomand Banajee who decided that Jehan would go far. After all, it isn't everyday that you find a 10-year old who grasps racing concepts easily and is willing to learn exactly how to go about becoming a racecar driver. Now, four years later, with plenty of karting experience under his belt, Jehan Daruvala has already made a name for himself as a karter. The young racer is now a part of the Sahara Force India Academy, after being snapped up from the One in a Billion hunt that the team conducted to discover a racer who could possibly be India's next F1 driver. And, while Formula 1 is still a long way away, Jehan is fast rising through the world karting ranks. Towards the end of 2012, Jehan became the first Indian karter to win the prestigious Macau karting event and was duly awarded the CIK FIA Asia Pacific championship trophy at the FIA Gala. Not a bad way to end his season of racing at all. 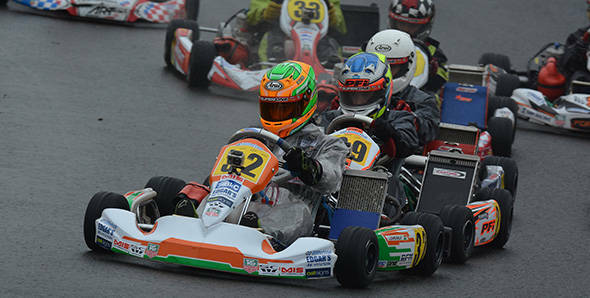 Continuing his good form, though, Jehan has made a thoroughly dominant start to the 2013 season of racing as well, winning Round 1 of the KFJ British Karting Championship at Rowrah in Cumbria, United Kingdom. The karter claimed pole position and then proceeded to win all his heats on the Saturday. He then won the first race on the Sunday, and, despite losing his place in the first corner of Race 2, still managed to recover and finish in fourth position. This strong performance could well be an indicator of things to come this season - as such, Jehan has a total points tally of 154, with which he heads to the second round at Wales in June. Well, given that he's leading the championship after Round 1, we're waiting to see what comes of the rest of the season. Good luck, then!